With pale skin, scarred and bruised from years of cybernetic alteration, Daggo stands out even amongst his species. Like the rest of them, he has a long curving neck and t-shaped head. He has one good left eye, with the other having long since replaced with a cybernetic. Two mechanical limbs protrude from a grafted apparatus on his back. His right hand has also been replaced with a cybernetic. Daggo Mouk loves to play with computers and enjoys interacting with them more than he does with people. Some may call him antisocial - and they'd be right. Daggo Mouk is extremely competitive and strives to become the best at every task he is given. The benefit of this cutthroat approach to life and work is that he will always give 100%, pushing himself to his physical or mental limits to overcome any task. However, Daggo Mouk’s overzealous ambition makes her insufferable to all but the most patient of companions, making it difficult to make friends while he either proves successful or utterly fails at being the best. Daggo Mouk prefers to push the rules to the absolute limit. While he is unlikely to actually break rules or disobey orders, he toes the line between what is allowed and what isn't at every opportunity. Daggo Mouk rarely acts without an alternate motive when it comes to lending aid or acting in a situation. Be it greed, power, or something else, almost undoubtedly Daggo Mouk is after something more than what he says - though sometimes Daggo Mouk is even blunt enough to admit to it. While his self-serving attitude comes as a boon, usually, to his survival and pocketbook, his relationships are often strained by his outright selfish attitude. Daggo Mouk's passion for technology extends beyond his talent with Slicing. He truly believes that wars can be won with technology, not soldiers, and will always try to avoid direct combat if he can afford it. Instead, he prefers to deploy clever traps with Explosives, or turn technology against others as a weapon. 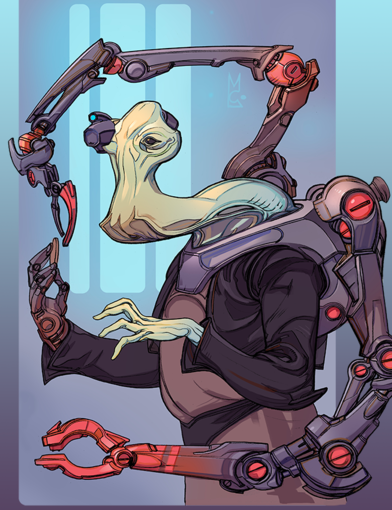 Daggo Mouk would rather overload a circuit breaker to shock a guard into submission than to test his luck with his hands or a blaster. If removed from technology or his gadgets, however, Daggo Mouk can easily be overwhelmed. Fortunately, he has no qualms with throwing a smoke grenade down and running for dear life. While Daggo Mouk avoids combat whenever possible, he has no qualms working with technology under the stress and pressure of combat. Daggo Mouk has trained himself to keep calm and focus intently on Slicing even while taking blaster fire from cover or when placed under time constraints. In truth, Daggo Mouk almost works better when under duress, and actually needs motivation, typically, when Slicing.